Could Tesla (TSLA - Get Report) really go private? Given that Elon Musk is a multi-billionaire, one can't say it's off the table. Particularly if he has found some means to fund such a big deal. As TheStreet's tech columnist Eric Jhonsa reasoned, "at $420, [Tesla] would have an enterprise value above $80 billion. After backing out Musk's stake, he'd need ~$65 billion in funding." TheStreet's Executive Editor Brian Sozzi flat out wonders if Berkshire Hathaway (BRK.A - Get Report) (BRK.B - Get Report) billionaire Warren Buffett could outright buy Tesla (and Musk). Never know, Buffett does have $111 billion in cash burning a hole in his pocket. One interesting tidbit? I spoke with a Tesla analyst a few weeks ago who told me that, according to his sources, Musk's jet has been tracked all over the world as he likely meets with high-profile billionaires. The analyst's theory is that Musk was trying to raise capital because Tesla is so short on funds. While it's possible for this to be untrue, could it be that Musk was not looking to raise funds because of a pending cash problem, but to put together a group to take Tesla private? Perhaps. And this would be why. While polite on the last earnings conference call, Musk also apologized for his behavior on the first quarter call with analysts where he became fed up with boring and "bone-headed" questions. Talk to some C-suite leaders and you'll find that Musk is far from the only one who could live just fine without quarterly reports, conference calls and shareholder demands. In fact, his update to employees on Tuesday, which can be read here, suggests as much: "Being public also subjects us to the quarterly earnings cycle that puts enormous pressure on Tesla to make decisions that may be right for a given quarter, but not necessarily right for the long-term." It would also allow Musk to live without the constant banter of short-sellers. 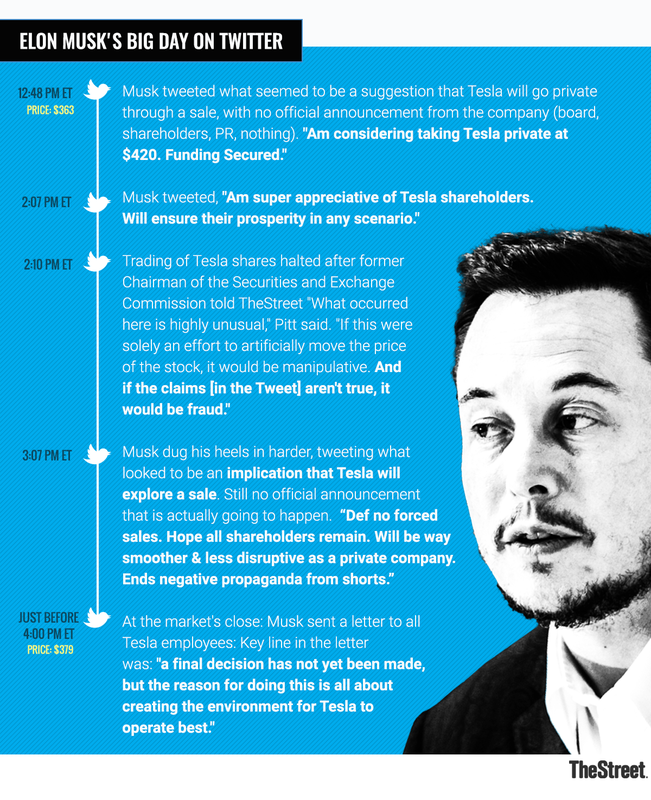 "A going-private deal would free Elon Musk from his frequent public-relations battles. It would also reduce compliance obligations. Overall it could make sense with a company like Tesla, which has had a lot of uncertainty," said David Russell, vice president of content strategy at TradeStation. He added that, "Investors are very divided about Elon Musk, with both lovers and haters. A deal to go private would potentially let him keep his fans and get rid of detractors." #2. Tesla's Stock Is Undervalued? Another reason for Tesla to go private? If Musk and board members felt that a bigger payday would be off in the future. In other words, buying up the company now and waiting several years to re-enter the public markets would allow Musk and his backers to reap substantial rewards. Imagine a Tesla IPO in 2025 -- by then the company may be consistently profitable and have autonomous semi trucks roaming the road. Talk about a great pitch to the investment banks. Now that management (and possibly the investors in this privatization deal) can see a clear path to profitability, there may be an opportunity to buy low and sell high. Granted, long-term profitability is far from a guarantee, but should Tesla maintain its current production trajectory, while also getting its Gigafactory 3 up and running smoothly, one could argue the company will be worth a lot more in the future than it is today. Said Russell, "The real question in Tesla, unlike most companies, is whether it will successfully become a major U.S. automaker. If it does, the sheer size of the market could justify a much higher valuation. Going private would let Musk focus on accomplishing that key goal." Could Tesla also be overvalued? Some may say that by Musk taking Tesla private at $420 per share, it effectively "locks in" its current valuation. To be sure, the list of concerns on Tesla's outlook -- and risk to its valuation -- run long. "Our concerns around the fundamentals remain consistent: sustainability of Model 3 gross margins entering 2019, uncertainty of the true level of demand for the Model 3 entering next year once the $7,500 credit declines, the status of the 420k net reservations, the unsustainable capital structure, and high valuation, in our opinion," says Needham 7 Co analyst Rajvindra S. Gill. In the end, there could be something for bulls and bears here. For bears who believe Tesla is a steaming piling of you know what, they essentially now know that Tesla's stock is capped at $420. For bulls, there's 10% upside on the table if they buy in now and Musk delivers.